The idea that I as a human should not be free to access my own health information, especially using my own money – even though I can buy weapons and anything else I want – and rather should be legally prohibited from doing so, summarizes the root of the fundamental flaw we’re working to change in our healthcare system. While Holmes may be a prodigy and a billionaire, I wonder how much real-world experience she has interacting with real world patients. It’s likely to be minimal, since she readily admits to barely having a life outside of Theranos. She’s quoted as saying she “doesn’t really hang out with anyone any more” and also doesn’t date, saying she “literally designed my whole life for this.” She even chooses her wardrobe based on efficiency and elimination of the need to make decisions. Certainly she has advisors — some of them might want to clue her in on what the average patient’s situation looks like. Most of my patients don’t have the means to buy anything they want. Many haven’t had the opportunity to attend college and would find it hard to understand why someone would drop out. Some of them barely graduated from high school. General literacy is an issue, pushing health literacy farther down the list. Most of our patient education materials are written at the fifth grade level and even then it’s still not understandable. I’m puzzled by her reference to buying weapons as well as her premise that we aren’t already free to access our own health information. Although it might be sometimes challenging (as Mr. H has illustrated in his quest to get a copy of his hospital chart), records are generally more open than they’ve ever been. I’m confronted on a regular basis by patients who have received laboratory results directly through a patient portal and are worried about what they see since it’s often delivered without context. I have had several patients bring in printouts from an EHR patient portal and ask for me to explain high or low lab values when they see them on the weekend and can’t get in touch with the ordering physician. Unfortunately, they’re often out of context even for me. If I don’t have access to the ordering physician’s thought process or other benchmark values, I can’t really advise the patient one way or the other. Maybe it’s a low value and it’s trending up or maybe it’s getting worse, but it’s often impossible to tell. Knowing that many patients don’t understand the idea of reference ranges (defined by statistics – so that you can be “out of range” but still healthy) it’s likely they won’t understand more complex concepts such as the positive predictive value of a test or its ability to rule in or rule out a disease. In the interview Mr. H referenced, the examples of breast and prostate cancer are mentioned. Screening tests can lead to false positives and unnecessary procedures. Over the last several years, we’ve seen PSA testing fall out of favor, but patients still request it. Once I discuss the evidence, a good percentage of patients decide to opt out. Given the availability and accessibility of cheap testing, patients might opt in to testing that could be dangerous to their health. Theranos has been instrumental in creation of Arizona laws that allow patients to order their own tests. Based on the fact that tests aren’t without risk, I’m not sure I agree with that approach. I also disagree with their premise that 40 percent of people don’t get blood tests ordered by their physicians because of the fear of a traditional blood draw. Holmes is admittedly “terrified” of traditional needles. I agree with her assertion that cost is an issue that prevents patients from receiving recommended tests, but I’ve only seen one patient in my career with an actual fear of needles. I do agree our healthcare system is broken. If Theranos can compete with the large reference labs, everyone will benefit from reduced costs, improved access, and less-invasive testing. If they inspire patients to take charge of their health, even better. But I’d challenge them make sure they’re putting their proverbial money where their mouth is by also providing education, not only to patients, but to the greater community. Holmes is experimenting with life in the outside world and has been speaking to young women to promote academic achievement. I’d love to see her champion health literacy so that the average person can truly become empowered to take charge of his or her own health. Theranos has multiple job postings for creative, sales, and marketing positions – what better way to leverage them? Even though she’s dedicated her life to solving a narrow problem, she may find other ways to think about it as well as experiencing a greater connection with the people she’s trying to serve. 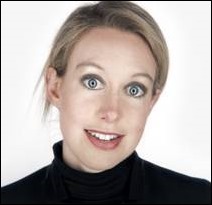 What do you think about Theranos? Email me. My lab friends are puzzled by why Holmes is such a big deal. Lots of companies have figured out how to do mass spectrometry on very small samples, and prices are coming down all the time. About the only innovation one can pinpoint is her effort to make state legislatures agree that patients can order their own lab work–a dubious achievement if ever there was one. Perhaps there is another platform for speaking out against right guaranteed by the Constitution and Bill of Rights…. Re this article quote: “”I realized there had not been a sole female founder-CEO of a multibillion-dollar technology company. I didn’t believe it. I still don’t believe it.” – isn’t Judy exactly this? Health literacy is, as you may agree imbeded in the archaic public health concept of health promotion, which is still rooted in a pre-internet, paternalistic medical model approach. Your comment “the average person can truly become empowered to take charge of his or her own health” is spot on, italcize “his or her.” When you look up Health Literacy at health.gov the answer to the question “Who is reponsible for improving health literacy’ states: “The primary responsibility for improving health literacy lies with public health professionals and the healthcare and public health systems.” How is THAT working for us? Perhaps Ms. Holmes analogy is ironically correct, a weapon can be used for good (crime prevention) or bad, how it is used, intent and training are variables. Giving patients unfetered access to their medical data without context, training in a usable format accompanied by an actionable plan is like handing a loaded weapon to a random person on the street. Oh yeah, we allow that. Theranos states on their website they will never charge more than 50% of Medicare reimbursement rates for labs. Our lab oligarchy in this country charges many times more than that, and will quickly put patients in collections if their insurance doesn’t cover the charges. If a patient wants a lab test it is their own body, and they deserve the right to have that information. The literacy question is false equivalency, and would deny individuals who can manage their own diseases that ability. You can get this by walking into any number of Walgreens. If I have high cholesterol and I am working on my diet and taking meds, there should be no reason why I shouldn’t be able to check my own damn labs.